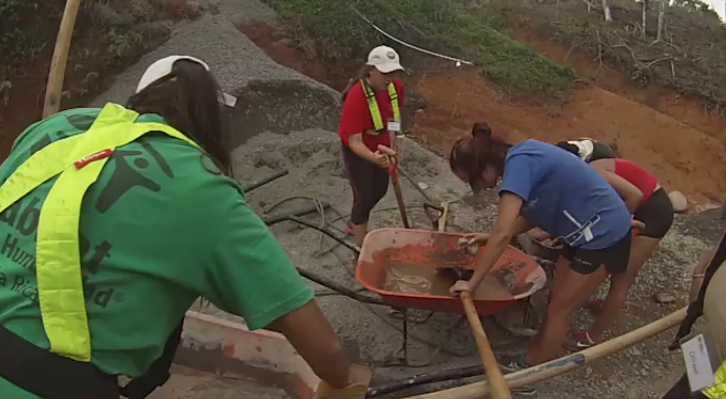 As part of UGA Costa Rica’s Housing and Household Economics Maymester program, a group of eight UGA students and two faculty members traveled to Puntarenas, Costa Rica to participate in an international Habitat for Humanity build as a service-learning component of the experience. During the four-day build, students chronicled their experiences via journal, detailing feelings and experiences related to the build. Join us for a three-part series summarizing their endeavors. Read Part I here! Day three brought with it both difficulties as well as positive experiences. Fatigue had really set in for the group, and there was a sense of frustration that much of the digging had not yet been completed. Students push through fatigue and continue to get dirty at their build site. The group was treated to a cultural experience at the end of the day, however. The students made empanadas with the extended family and future homeowners. The group was grateful to spend time with the family, learning more about the Costa Rican culture. One more day to go! Stay tuned for the time-lapse video of the team’s hard work and success. Blog post contribution by Andrew T. Carswell, Jorge Ruiz-Menjevar, Ben Jacobs, Blake Bolton, Raymond Chau, Sarah Ernst, Will Johnson, Dilreet Kaur, Jessica Tante, & Amanda Vargas, UGACR HACE program members. Edited by Alex Fylypovych, UGA Costa Rica Photojournalism Intern.